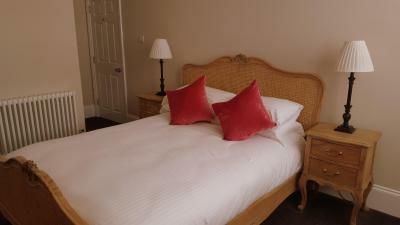 Lock in a great price for Red Brighton Blue – rated 9.8 by recent guests! The hotel has been restored to its periods details while providing all the latest technology needed to make your stay enjoyable. A true gem in the middle of Kemptown! Lovely house with incredibly helpful staff and great breakfast. Exceeded my expectations. The staff where very helpful and friendly, gave us a lot good ideas of things to do around Brighton. Absolutely loved the building. Staff were so lovely and welcoming! We will definitely be back. 10/10 for everything! Hosts were very friendly and accommodating. Excellent breakfast. Walking distance to the city center . Good pubs nearby. Our hosts were delightful...deeply enthusiastic about our comfort; beautiful, loving care details in the renovation, spotless, charming, a bit away from town--which we appreciated--green-conscious, gracious about letting us check in early AND leave our luggage beyond checkout; comfy bed, delicious HOT breakfast (beyond yogurt and fruit! ), endless coffee...and the world's greatest name. We loved it and would stay again in a heartbeat. Come visit San Francisco, you two...lovely to meet you both! And thanks for recommending the Brighton Museum--loved that too...more people need to know about it! Cheers! The whole experience was 5 star plus. Particularly liked the friendly and extremely helpful attitude of Steve the owner. Instantly felt at home and very welcome. Beautifully renovated traditional property with all modern features and comforts. Lovely king room with sea view, excellent modern bathroom. Complimentary snacks, tea and coffee and cold drinks in fridge. Charming host in Steve. Great freshly cooked breakfasts. Very fast wi-fi. Complimentary bottle of prosecco delivered to room by Steve as it was my husband’s birthday- a lovely touch! Extremely well designed rooms and bathrooms with every comfort in mind. Light, airy. I stayed in two different singles and both were perfect for one. Immaculately clean. 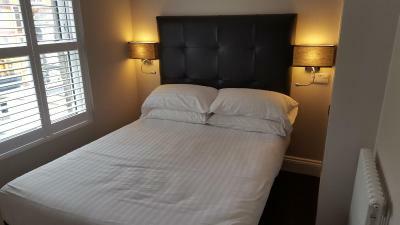 Lovely comfy beds and duvet and night lights in the bathrooms. Strong Wifi. After one short conversation with Peter I felt we were kindred spirits and had known each other for ever. His tips on where to go enriched my visit to Brighton and he also cooks a great breakfast! Would revisit the town just to stay here again. Red Brighton Blue This rating is a reflection of how the property compares to the industry standard when it comes to price, facilities and services available. It's based on a self-evaluation by the property. Use this rating to help choose your stay! 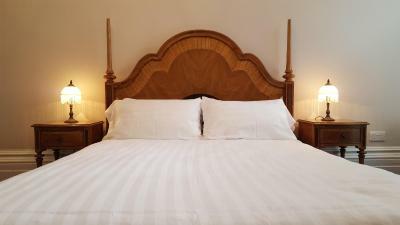 Located in Brighton & Hove, within an 8-minute walk of Brighton Pier and 2,650 feet of The Royal Pavilion, Red Brighton Blue offers accommodations with a terrace. Popular points of interest nearby include Brighton Dome and Komedia. The Brighton Center and Victoria Gardens are a 17-minute walk from the hotel. At the hotel, all rooms are offer clothes storage, a flat-screen TV and free toiletries. 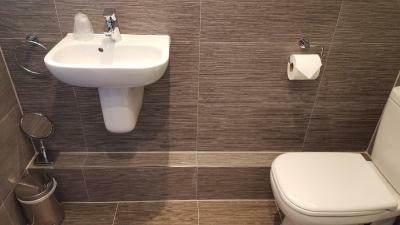 Featuring a private bathroom, rooms at Red Brighton Blue also offer free WiFi. 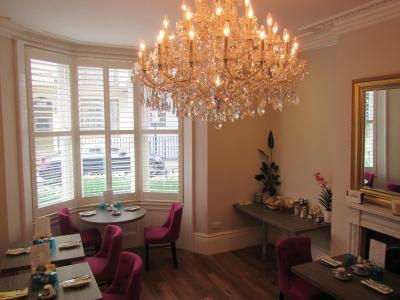 Guests at Red Brighton Blue can enjoy a Continental breakfast. I360 Observation Tower is a 20-minute walk from the hotel, while Churchill Square Shopping Center is 1.1 mi away. London Gatwick Airport is 24 mi from the property. 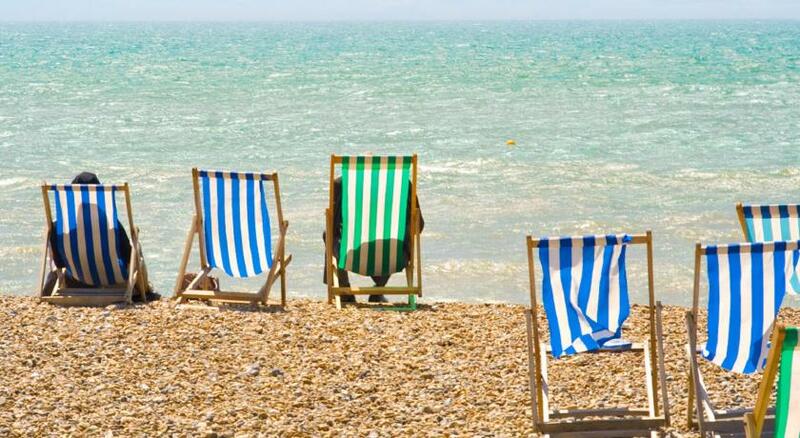 When would you like to stay at Red Brighton Blue? 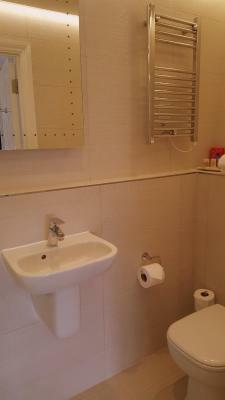 This double room features a tea/coffee making facilities. 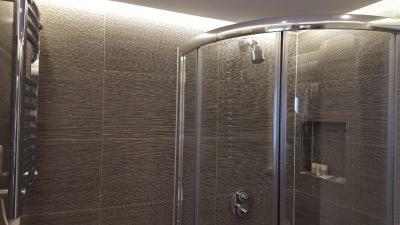 Each room has a luxury en-suite with rainfall shower. 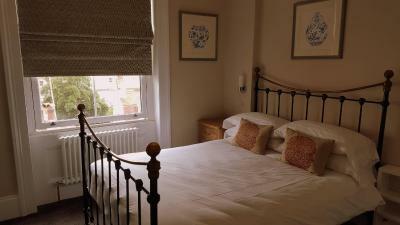 This double room features a fireplace, seating area and tea/coffee making facilities. 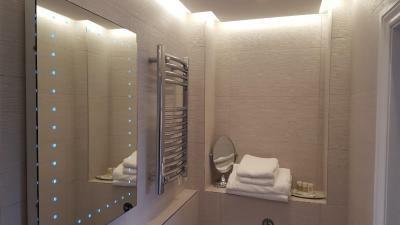 Each room has a luxury en-suite with rainfall shower. 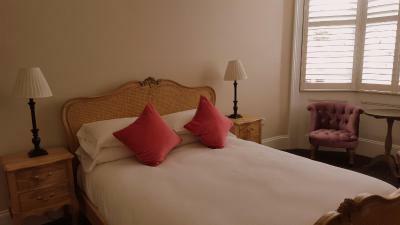 This small double room features a tea/coffee making facilities. Each room has a luxury en-suite with rainfall shower. This single room features a tea/coffee making facilities. 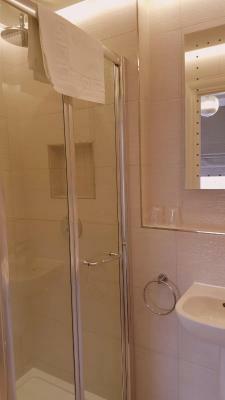 Each room has a luxury en-suite with rainfall shower. 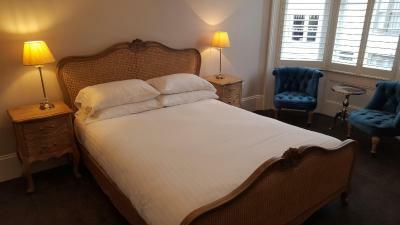 Newly refurbished 11 bedroom boutique guest house, just off the sea front. We offer a perfect combination of: IDEAL LOCATION – just off the sea front, 2 mins walk to bars & restaurants and less than 10 mins walk to the Pier, Royal Pavilion and city centre. HISTORIC, CHARACTERFUL GEORGIAN TOWNHOUSE BUILDING – set over 5 floors, with well proportioned rooms, large windows & many original features. 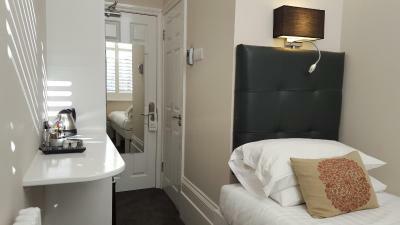 11 LUXURY BEDROOMS ALL WITH ENSUITES – all tastefully decorated & maintained to the highest standards, all offering the latest entertainment technology incl smart internet TVs, free access to our DVD movie library and free wifi in all rooms. COURTYARD GARDEN – 24 hour access to our small, beautiful courtyard garden, a relaxing oasis of lush green planting, flowers, cool calming water features & plenty of space to sit, chat & enjoy with friends. BEST BED & BEST BREAKFAST – to complement our luxurious beds, pillows & duvets, we offer one of the best breakfasts in Brighton too. Everything freshly cooked with the best ingredients. TRULY FRIENDLY, PERSONAL SERVICE – with live-in owner managers, Peter and Steve, on hand to offer any assistance or advice to enhance your stay. Hotel surroundings – This neighborhood is a great choice for travelers interested in nightlife, pubs and cafes – Check location Excellent location – show map Guests loved walking around the neighborhood! House Rules Red Brighton Blue takes special requests – add in the next step! Red Brighton Blue accepts these cards and reserves the right to temporarily hold an amount prior to arrival. Please inform Red Brighton Blue in advance of your expected arrival time. You can use the Special Requests box when booking, or contact the property directly with the contact details provided in your confirmation. Kindly note the accommodations is located on the first, second and third floors, and is accessible via stairs only. Therefore it may not be suitable for guests with mobility impairment. Please note there is no elevator at the property, but the property will assist with luggage should you need it. Please ask at reception. Parking is available on streets around the hotel at a cost of GBP 10.00/day. Please let us know in advance if you require parking. When you arrive please pull up outside the hotel to unload, check-in and collect your parking voucher and we’ll then help you find a parking space. You must show a valid photo ID and credit card upon check-in. Please note that all Special Requests are subject to availability and additional charges may apply. Please inform Red Brighton Blue of your expected arrival time in advance. You can use the Special Requests box when booking, or contact the property directly using the contact details in your confirmation. From my experience, I don't think there's anything that could be improved here! The location is great, just off the seafront in a quiet lane that's a very easy walk from the city centre, pier, bars, restaurants and attractions. I was in town for a friend's birthday and had a packed itinerary of catching up with mates and roaming Brighton on foot. My cosy single room in Red Brighton Blue was perfectly formed and full of light, making it the ideal relaxing haven at the end of a long and fulfilling day. It really was the perfect base for my trip. I'll definitely be coming back! 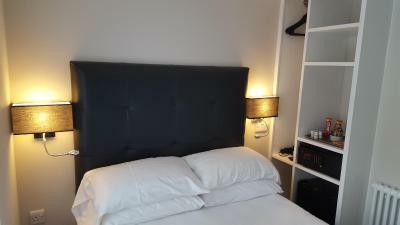 I was late in booking a room for a couple of days to attend a conference in Brighton and don't know the area very well, but I'm so glad I chose to stay at Red Brighton Blue. Upon arriving I discovered that I'd stupidly left my phone in a taxi and Peter could not have been more helpful. He rang the taxi company and kept ringing my phone until the taxi driver picked up. After a short while the driver came back to return it. I was very relieved and very grateful! 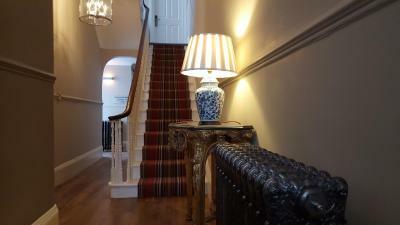 The hotel itself is beautifully appointed and spotlessly clean throughout. I had a king room with sea view on the top floor and it was perfect. Peter and Steve were wonderfully helpful and attentive hosts throughout, I can't recommend them enough. Really lovely, welcoming host Peter made us feel at home. Very clean & comfortable room with a delicious breakfast in the morning. We would definitely recommend! The hosts were incredible. They meet us on arrival, knew us by name and provided excellent friendly service from the start. They managed to balance the warm welcome with the typical British avoidance which is amazing. Our stay could not have been better. This place has been finished to a very high standard. The bed was very comfy and the breakfast options extensive and of good quality. Lots of nice touches in the rooms including a coffee machine, free snacks, Ren soap, Netflix and a movie library! Steve, the owner, was friendly, chatty and helpful. I highly recommend this place. Really clean and comfortable room, lovely staff, great breakfast! The hosts were friendly and welcoming. 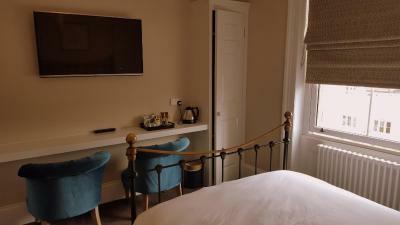 The hotel is in the perfect location, in walking distance of all Brighton’s main attractions. 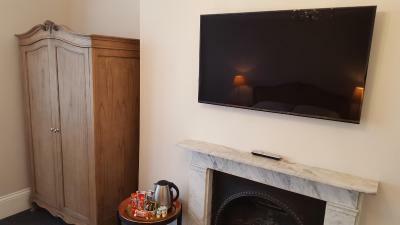 The rooms are beautifully decorated and immaculate, with extra touches such as a fridge with complementary drinks, kettle, hot drinks, coffee machine and smart tv. The beds were super comfortable and the breakfast is delicious! This is a beautiful Hotel, the staff are very welcoming, nothing is too much trouble. It is clean and fresh, the breakfast was gorgeous. Nothing is too much trouble and facilites were first class. Lovely relaxed atmosphere and friendly hosts. 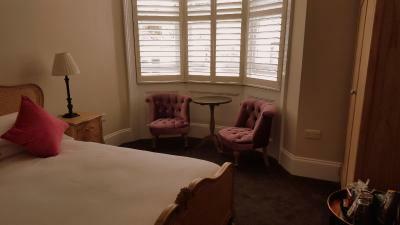 Loved the little extras in the rooms free water and soft drinks in the mini fridge and curlywurlys with the tea and coffee. Peter and Steve were the perfect hosts, friendly and informative. 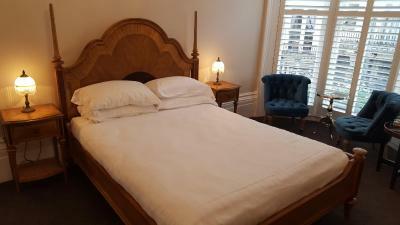 The rooms were spotless and sympathetically restored to include all the modern conveniences expected. The bed was extremely comfortable. The breakfast was fabulous and freshly cooked to order. When checking in we were asked if we had any dietary requirements. 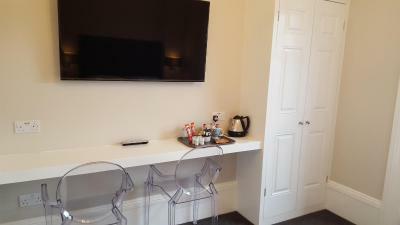 The room was equipped with fridge, kettle and coffee machine with pods. There was a wide range of tea bags to choose from. There were extra little complimentary touches, water and soft drinks in the fridge. Biscuits and chocolate which were replenished daily. There was a large TV with over 1000 films and Netflix all free to watch. Whilst they don't have parking we found a space within 100 yards and parking permits were easily arranged. Peter and Steve are amazing hosts and together with their staff ensured we had a memorable stay. This place was amazing. Steve and Pete were both absolutely lovely, as well as their team at breakfast (which was also absolutely incredible). There was nothing at all that was too much trouble, and there were loads of little thoughtful touches. The building itself was also gorgeous. Our room was probably the smallest but had absolutely everything that we could need. The location as well was amazing- I only wish we could have stayed longer! Steven and Peter were very welcoming hosts and nothing was too much trouble. 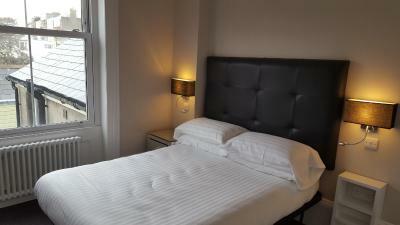 The property was spotlessly clean throughout and our room was a good size with a very comfortable bed. We really felt we got great value for money and would definitely return. It was so lovely my 22 year old daughter wanted to move in!